An interesting choice of words from the Angel Gabriel, “Favor with God”. This has to be where Mary’s fullness of grace comes in because if I was told I had favor with God and then my life went on the roller-coaster ride that Mary’s did, I am not sure I would believe Archangel Gabriel and I shared the same definition and understanding of “favor”. This verse from Scripture and all that happens to Mary after this moment often occupies my contemplation during my recitation of the Rosary. In particular, and probably not surprisingly, while saying the Joyful Mysteries. Here in the Annunciation, we hear these profound words spoken to Mary, along with the astounding news that God has chosen her to bear His beloved Son. Although I try to place myself in that room, hearing those words, I simply cannot fathom the depth of Mary’s emotions in that very moment, that unique experience, that Mary alone has been graced to experience. Mary’s questioning was brief, and it was not about what God can do but how it was to happen. Gabriel assured her with a simple, yet again profound statement from the angel, “The Holy Spirit will come upon you, and the power of the Most High will overshadow you. Therefore the child to be born will be called holy, the Son of God. 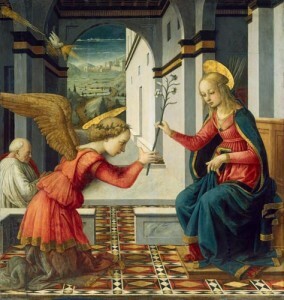 “ With her response, “Behold, I am the handmaid of the Lord. May it be done to me according to your word,” Mary modeled for us how one can accept the Will of God, with incredible peace and faith. This ‘favor’ that was found to be with Mary becomes increasingly harder to imagine as the rest of the story of Mary’s life with Jesus unfolds — in what we who are not full of grace, might see as a complete unraveling of God’s favor . As a woman, I know how I would perceive this journey if I were to put myself in Mary’s situation. Mary is the ultimate model of trust and faith, because we have no evidence that she lost these gifts as I would have if my expectations were seemingly twisted completely around. I would not have expected to travel to help out a slightly more pregnant cousin right after finding out I’m giving birth, especially if that baby was the Messiah! I would have expected to have the baby at home with my mom and maybe some women from Nazareth to help out, not in a barn all the way in Bethlehem with only my husband’s assistance. After my son’s unexpected birth in a manger, I would have expected to return back to Nazareth, again to the comfort of my home and my family and community to help me raise my new son. I would have never expected this urgent, I am sure frightening escape from Bethlehem into Egypt. Did they use the gold, frankincense and myrrh to live on until Joseph found work? At the presentation of Jesus in the Temple, Mary finally receives the validation of what was told in the Annunciation – her son truly is the Messiah, the Son of God. I would never have expected that possible relief and even elation to be peppered so quickly and heavily with the prophecy of my son’s eminent suffering and death, as well as the piercing of my own heart. How does one prepare for the misplacing of their child during a long trip? What thoughts did Mary ponder before she found Jesus in the Temple? Was she praying for consolation or direction on where to find him? In this situation, I am fairly confidence that she and I would have very different response at finally locating the child. My lack of grace, and cooperation with the many wonderful virtues God has available to me, as well as not possessing Mary’s gentle temperament leaves me (often) vulnerable to less than desirable responses. Allison Gingras: Catholic radio host, writer and inspirational speaker. Allison founded Reconciled To You (#RTY) ministries in 2009. Allison hosts Catholic 24/7 Wednesday evenings at 7 pm on Radio Cor Mariae. She currently offers Women's Retreats: Forgiveness, Trust, and Joy. Columnist for Catholicmom.com and Ministry and Liturgy Magazine. Creator: Words With Jesus devotional App available for iOs and Android. Hosted Social Media Evangelization and The Gifts of the Holy Spirit on CatholicTV's BLINK series.